Who says flyers don't work these days? 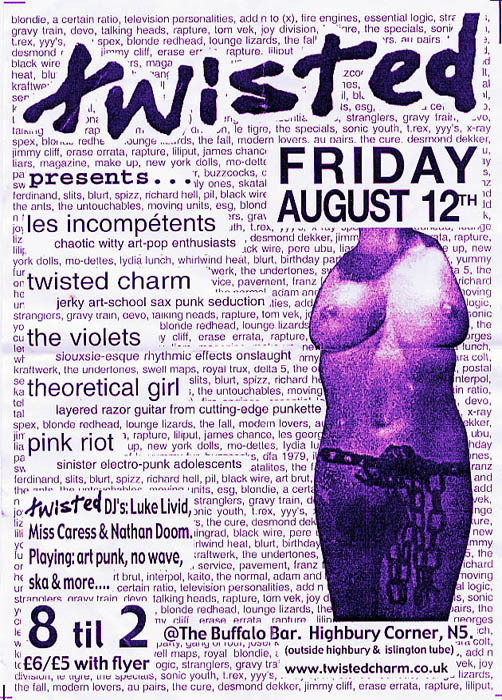 There I was, hanging out and looking cool at the Soho Dolls gig (translation: standing around aimlessly between bands) when a passing girl thrust the traditional crumpled bit of paper into my hand. I glanced at it - and I thought, 'ello. This looks interesting. 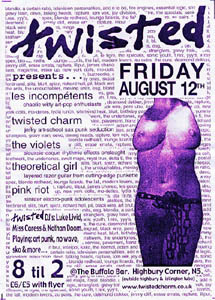 Five bands, with such intriguing thumbnail descriptions as 'Siouxsie-esque rhythmic effects onslaught' and 'Sinister electro-punk adolescents', and a DJ playlist which encompasses such heroes of the left field as the New York Dolls, The Fall, Au Pairs, Interpol, Pil, Black Wire, Lydia Lunch, Tom Vek, and the Lounge Lizards. Wait a minute, I thought, these people have stolen my record collection! So, on the strength of that flyer, here I am in the Buffalo Bar, ready to absorb some of that left-field rock 'n' roll love juice. The first band is already on stage, and they're making an encouragingly ramshackle noise. 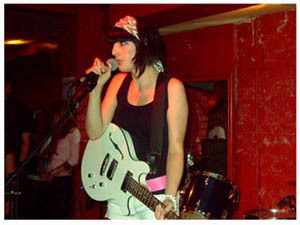 Pink Riot comprise a guitarist, drummer, and keyboard-walloper. Their sound is full of fuzztones, squawks and splinters of six-string noise, while the vocals are yelped out by the guitarist as if someone keeps pinching his bum. 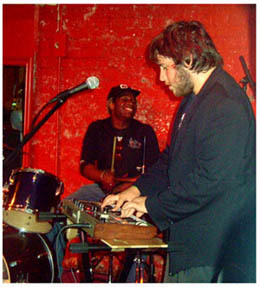 The whole thing is nailed to a clattering rhythm, while the principal visual entertainment comes from the keyboard player, who hauls his instrument about as if he's trying to shake its circuit boards loose. Although the set is as brief as a blink of an eye, Pink Riot manage to pack in enough punked-up odd-angled weirdness to see us all through the week. Suddenly, we're off on another tangent. Theoretical Girl is just that: a girl. By herself, with only a guitar and a rhythm she made earlier. I confess I was expecting her to unleash a rampaging PJ Harvey-style blast (must've been the pink stilettos that fooled me) but in fact we're in a somewhat more chilled-out musical area. Theoretical Girl's music is precise and meticulously crafted, quietly insistent rather than a big bad ramalama sound. The beat-box rhythm cracks and thunks like 1980, the guitar interjects with a certain restrained authority, and the vocals skim the surface like stones across a lake. It's a style that makes reference to sixties pop as much as the new wave-isms that we might more readily expect. The songs are strong, with plenty of snag-yer-brain hooks, and Ms T. Girl herself, although unfailingly polite and unassuming throughout, nevertheless manages to exude enough presence to keep the audience's attention. She's a fine demonstration of how a solo performer can command a stage without any histrionics or grandstanding. Her tunes may not roar and snarl like punk rock tigers, but they sneak up on you and quietly, persistently, elbow their way into your head. A swift glance around the web at other reviews of The Violets reveals that practically everyone mentions Siouxsie somewhere in their description of the band. And....guess what? I'm about to do the same. But not because the band are particularly trying to do a Banshees, or even because their overall sound is particularly Siouxsie-esque. It's just that quite naturally and without any contrivance, The Violets' singer has exactly the kind of cold-hearted holler that recalls Siouxsie's vocals on the first two Banshees albums - you know, the ones where her voice veers wildly between 'sternly assertive' and 'throwing a strop'. Perhaps it's a south London thing, for The Violets come from the same saaarf-of-the-river hinterland that Siouxsie once called her own. But, now that I've got the obvious comparison out of the way, we can enjoy what The Violets do. The singer's stage presence is impeccable and implacable: no banter, no cheesy grins at the crowd, just an air of cool, self-contained mystery, mixed with a certain don't-mess-with-me punk rock toughness. She stomps up and down the stage in a slinky dress and mop of blonde hair, looking like she's been evicted from Andy Warhol's Factory for having too much attitude. All the while she lets rip with That Voice, a glorious caterwaul that shoulders its way to the front of the musical racket like a granny at a jumble sale. The musical racket itself is a fine thing, too: a frantic scrabble of skittering guitar and tumbling drums. There is no bass, but its absence isn't noticeable because the guitarist and drummer work overtime filling the space where the basslines would normally be. It's an exhilarating experience, hearing such a big, fast, overdriven sound being generated by just two musicians, neither of whom, paradoxically enough, are making a meal of it. The drummer maintains an air of calm authority throughout, while his colleague on guitar leans casually into his riffs and runs, looking dapper in his Pete Doherty hat. Hmmm...not too sure about that, actually. I don't think Pete Doherty hats should be encouraged. Come to that, I don't think Pete Doherty should be encouraged. But the entire Violets experience is a wonderful jolt to the system, a flamethrower blast of cold fire, and I have a strong suspicion that I've just stumbled upon another favourite band. Following The Violets' spiky bombast is not going to be easy, but Twisted Charm start from a certain position of advantage. They're the organisers of this gig (hence the event's overall title of 'Twisted'), and they've got a healthy contingent of fans clustered around the stage. 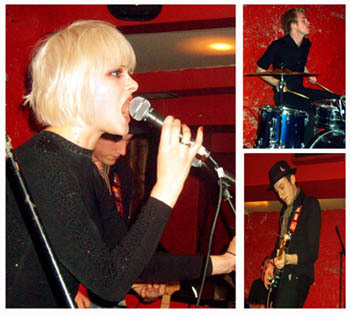 There are four Charmsters, black-clad reprobates all (style note: the drummer is sporting another Pete Doherty hat). The frontman looks like a youthful Bob Dylan, although I don't recall Bob ever wearing eye makeup like that. 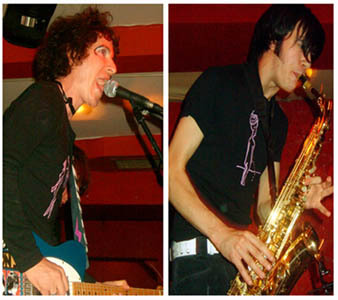 The band's secret weapon is their saxophone, which is fed through an array of effects pedals until it sounds more like the wailing of inner demons than an innocent brass instrument. The band kick up a jerky, no-wave jazz racket, all tightly-wound rhythms and chunky, choppy, guitar, the vocals on top in a fractious yawp. It's insistent stuff which provokes outbursts of dancing among the crowd, but the dominant element, and the main thing that gives Twisted Charm their unique identity, is that ever-keening sax, wailing and squalling like a dog in the night time. Standout song is 'This Is The London Scene', half warts-and-all anthem, half cynical put-down, with such lyrics as 'A&R men on the guest list instead of friends'. Well, the solution to that one is simple, lads. Make the A&R men pay! Twisted Charm jerk and swirl and stagger through a set of jagged punk-jazz-isms, and while it's clear that the band are, at heart, a pop group, there's enough bite and grit, weirdness and wildness in the music to take us to the outer fringes of pop-dom - which, of course, is where all the interesting stuff is to be found. One more band to go. 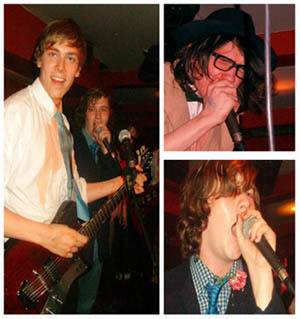 A bunch of well-scrubbed youths in improvised fancy dress scramble on stage. These are Les Incompétents, and if they look like a collection of schoolkids having a lark, that's because, more or less, that's exactly what they are. Apparently this combo originally formed to compete in a battle of the bands competition at school...and just kept on going. Now they're on the real life gig circuit, their first single is out, and indie scene-watchers from the NME upwards are hailing them as the coolest new thing since the last cool thing. So, what are they like? Well, if you've ever wished for a schoolboy-prank version of Splodgenessabounds, I'm happy to tell you that your heart's desire has just come true. If you are a devotee of self-consciously wacky comedy-punk, if your party just isn't complete without a boozy stompalong to the Toy Dolls doing 'Nellie The Elephant', then Les Incompétents are going to rock your world. Unfortunately, I have very little patience with any of this stuff, and notwithstanding the band's full-tilt bouncing, gurning and cod-rapping over fast 'n' crunchy riffs, my world remains stubbornly unrocked. I suppose we were due for a band like this - they tend to come round once every few years. I'm old enough to remember when the Notsensibles held down the position of the UK music scene's tame court jesters, and that must've been...what, 1979? Les Incompétents are the latest in this long and rather questionable tradition, and like all their predecessors they'll probably have a brief moment in the limelight and then vanish. Of course, there's always an outside chance that they'll rise above the confines of the novelty band slot. One of their songs, 'Much Too Much', contains some throwaway wit - 'Waking up in God knows where/my life's a mess and so is my hair' - which suggests there's a real songwriter in there somewhere. But for the most part, it's all a tiresome mess of contrived zaniness, and I'm rather relieved when the set's over. Still, that was a good gig. Four out of five ain't bad, and when one of the four sparkles with the rough-diamond brilliance of The Violets, that very definitely counts as a result. I'll certainly be catching up with The Violets again (and equally as certainly trying to avoid Les Incompétents). But it just goes to show...when someone comes round with a bunch of flyers, take one. Go to the gig. You never know - you may find good things, and you might even discover great things. A little bit of paper could open all manner of interesting doors.